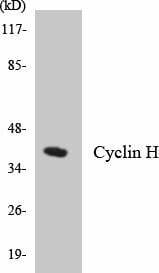 Cyclin H antibody detects endogenous levels of Cyclin H.
PBS, pH 7.4, 150 mM sodium chloride, 0.02% sodium azide, 50% glycerol. Synthetic peptide derived from human Cyclin H (aa262-311). Store at -20 degree C.
Small volumes of anti-CCNH antibody vial(s) may occasionally become entrapped in the seal of the product vial during shipment and storage. If necessary, briefly centrifuge the vial on a tabletop centrifuge to dislodge any liquid in the container`s cap. Certain products may require to ship with dry ice and additional dry ice fee may apply. 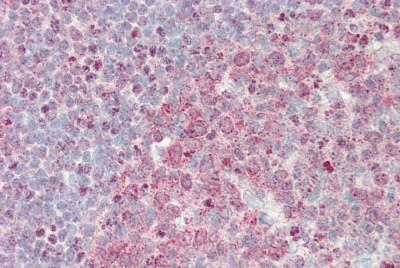 CCNH/Cyclin H belongs to the highly conserved cyclin family, whosemembers are characterized by a dramatic periodicity in protein abundancethrough the cell cycle. Cyclins function as regulators of CDK kinases.Different cyclins exhibit distinct expression and degradation patternswhich contribute to the temporal coordination of each mitotic event. This cyclin forms a complex with CDK7 kinase and ring finger protein MAT1. Western blot analysis of the lysates from HepG2 cells using Cyclin H antibody. NCBI/Uniprot data below describe general gene information for CCNH. It may not necessarily be applicable to this product. Regulates CDK7, the catalytic subunit of the CDK-activating kinase (CAK) enzymatic complex. CAK activates the cyclin-associated kinases CDK1, CDK2, CDK4 and CDK6 by threonine phosphorylation. CAK complexed to the core-TFIIH basal transcription factor activates RNA polymerase II by serine phosphorylation of the repetitive C-terminal domain (CTD) of its large subunit (POLR2A), allowing its escape from the promoter and elongation of the transcripts. Involved in cell cycle control and in RNA transcription by RNA polymerase II. 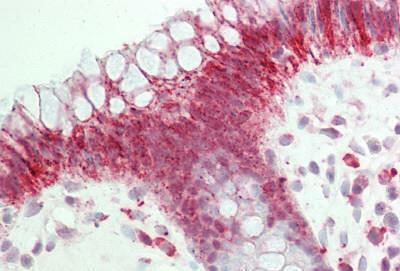 Its expression and activity are constant throughout the cell cycle. 1. Expressions of components of the CAK complex, CDK7, MAT1, and Cyclin H are elevated in breast cancer.